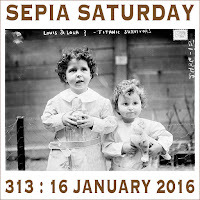 Welcome to a new year of Sepia Saturday and the start of a new set of themes which will run for the first half of the year. This year we are abandoning wordy prompts and just leaving you with an image which you are free to interpret as you like. You might want to look within the image for shapes, places, objects, words, colours ... or whatever you want : the choice is yours. And, in the finest Sepia Saturday traditions, you also have the choice of ignoring any talk of themes and just sharing an old photograph and a few new words. When Marilyn and I were putting this set of prompts together we thought it might be fun to have an hidden theme within a set of themes - let's see if anyone can spot it within the months to come. Whatever you decide to do with the above image - which is a 1942 photograph of the Grand Grocery Co. of Lincoln, Nebraska from the Library of Congress stream on Flickr Commons - do it on or around Saturday 2nd January 2016 and link it to the list below. 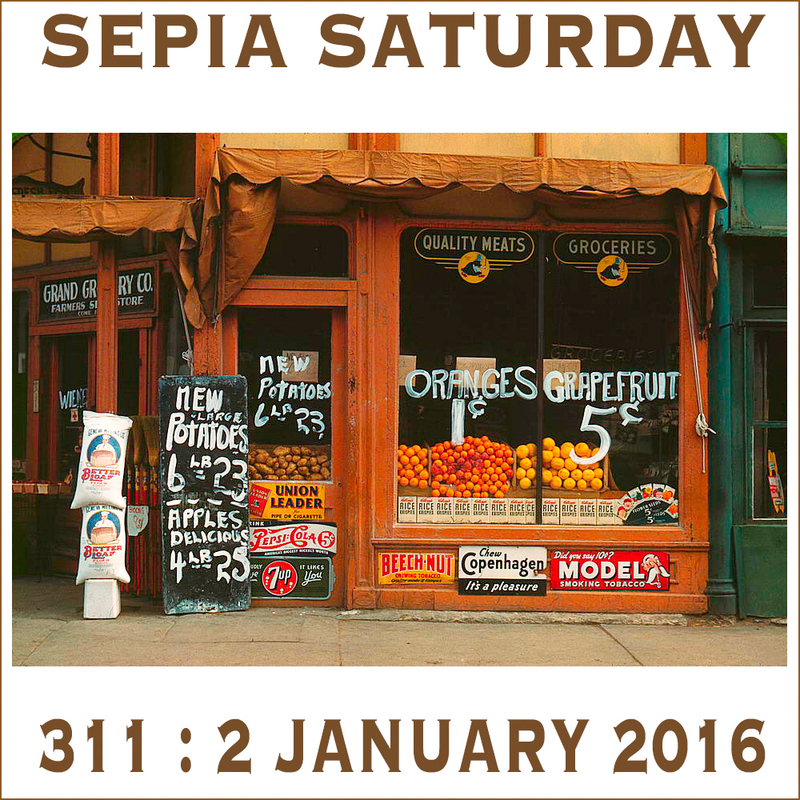 You can see the next couple of Sepia Saturday prompts below and a full list for the first three months of the year can be accessed via the link in the sidebar. Enjoy some window shopping with my look at shop frontages and shop signs. 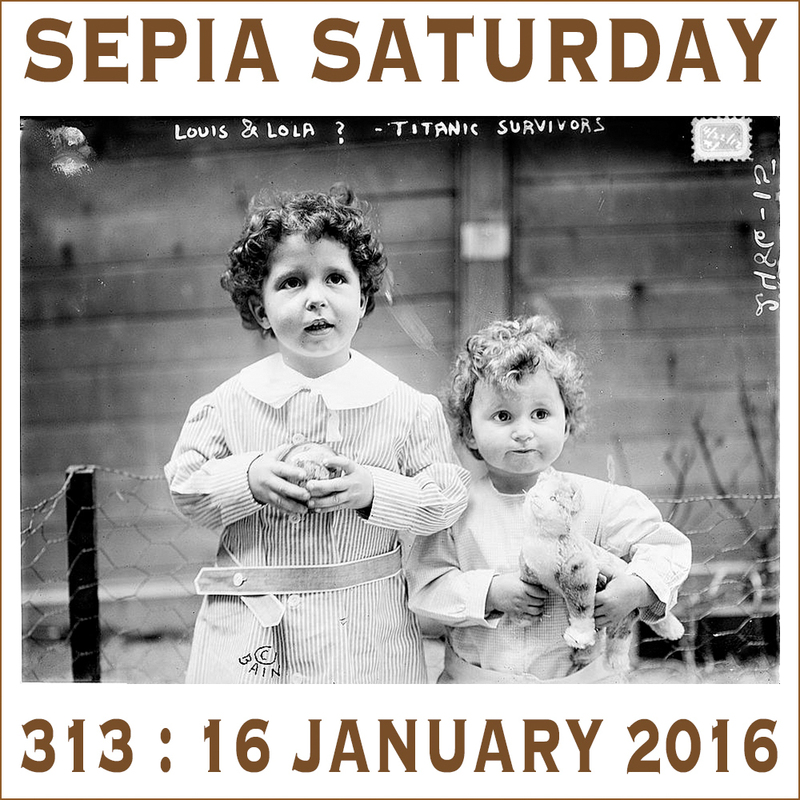 Congratulations Marilyn and Alan - I like the new Sepia Saturday header. Early this week for mine. Nothing to do with the prompt but more with the date. Peeling away the layers of long forgotten memories. Old grocery stores - Where & What are they now? It's been a while...please forgive me...imagine me offering you a piece of humble pie from the Wingfields Cake Shop. Yes, we have no bananas. Nor oranges, or potatoes either. Just a musical wish for a happy new year! Happy New Year, and all the best to all in 2016! Thanks very much for the inspiration image. My post entitled 'Family History: The Storefront of our Lives' will appear on Saturday. My 2x Great Grandmother owned a Confectionary Store in the early 1900s in Chicago, Illinois. A street scene - but what is going on and what is being said? Congrats on another new year of Sepia Saturday! Happy New Year to all! 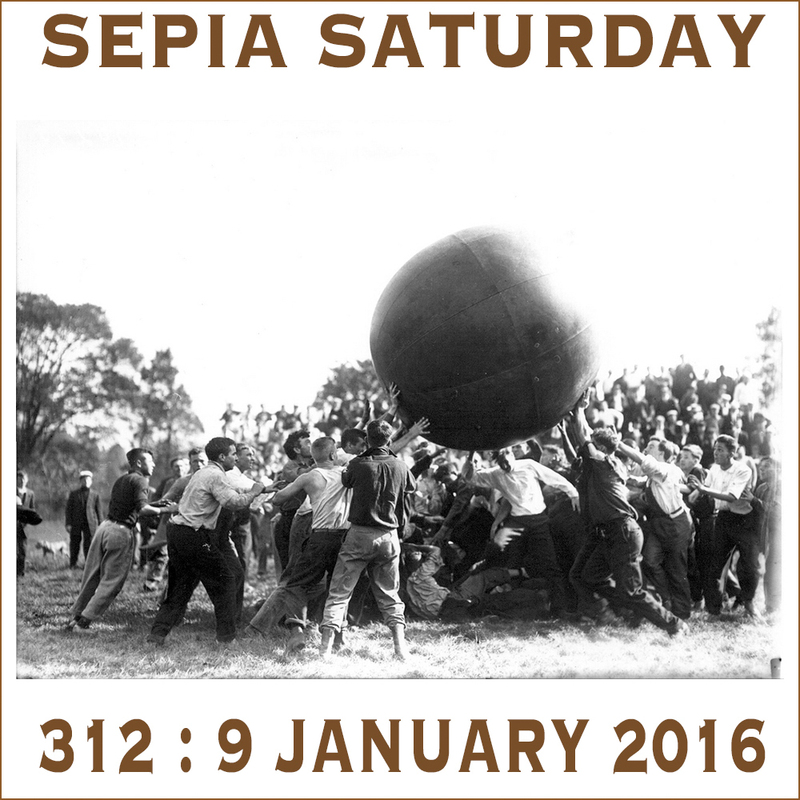 Looking forward to 2016 Sepia Saturdays. This is my first one. 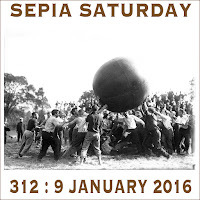 Looking forward to 2016 and keeping up with the keeping up on Sepia Saturday. You all are such a great bunch of people that makes the job easier. Happy New Year to one and all. Here we go with another year of fun. Happy New Year to all! I hope this is a wonderful year for all of us. I happened to catch Little Nell's post and it brought back a few old memories of my own, so I hope you enjoy a bit of my past!